In January and February 2018, the Center on School Turnaround (CST) at WestEd hosted two online Thought Leadership Forums for state education agency (SEA) officials who are members of the Leadership Council of the Network of State Turnaround and Improvement Leaders. “These forums are designed to provide an opportunity for networking across states specifically around the areas of the CST’s four domains. They allow for deeper dives across all four domain areas while presenting examples of practices across the field,” says CST Director Carlas McCauley. This brief summarizes the information presented in the January and February 2018 forums, which explored the transformative uses of turnaround leader competencies for supporting existing principals and as a basis for identifying, recruiting, and developing new leaders to serve in complex and challenging settings. Recommendations for SEAs on how to support and develop turnaround leaders and a list of useful resources are included. 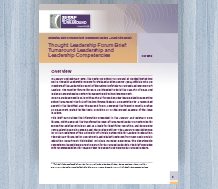 Visit the Thought Leadership Forum Brief: Turnaround Leadership and Leadership Competencies resource record to learn more and to download your copy.